Galaxy Forum is the primary education and outreach initiative of ILOA, it is an architecture designed to advance 21st Century science, education, enterprise and development around the world. Galaxy Forums are public events specifically geared towards high school teachers, educators, astronomers of all kinds, students and the general public. Presentations are provided by experts in the fields of astrophysics / galaxy research, space exploration and STEM education, as well as related aspects of culture and traditional knowledge. Interactive panel discussions allow for community participation and integration of local perspectives. More than 70 Galaxy Forums, with over 300 presentations to date. Held in 26 locations worldwide including Hawaii, Silicon Valley, Canada, China, India, Southeast Asia, Japan, Europe, Africa, Chile, Brazil, Kansas and New York. Started with Galaxy Forum USA, July 4, 2008 in Silicon Valley, California. International Lunar Observatory Association (ILOA) is an interglobal enterprise incorporated in Hawaii as a 501(c)(3) non-profit to expand human knowledge of the Cosmos through observation from our Moon and to participate in internationally cooperative lunar base build-out, with Aloha – the spirit of Hawaii. 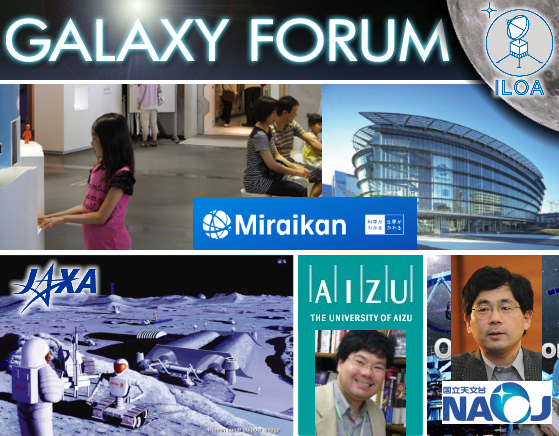 The theme of Galaxy Forum Japan this year is 21st Century Frontiers of Astronomy and Observation. The event will be held at the NAOJ Large Seminar Room and 4D2U Dome Theater. Seating is on a first come first serve basis (limited to 80 participants). Most of the presentations and discussion will be in Japanese. Here is a link to a local website devoted to the event (http://moonstation.jp/ja/events/Galaxy_Forum/). 14:00 Panel Discussion – Advancing Galacticity in 21st Century Education: Bringing Galaxy (or galaxies) to the Classroom Moderated by Kumiko Usuda-Sato with support from Junya Terazono. オニヅカ・サイエンス・デーなどでの天の川銀河の模型工作 / “Make your own Milky Way model” activities at Astronaut Ellison Onizuka Science Day etc. →天文学者はどのようにその地図を描けるのか？/ How can astronomers draw a map of our own galaxy? 昔は冥王星まで(中学)。今は銀河まで。/ At a Junior high school: students previously learned about the Solar System (Sun-Pluto). Today they also learn about galaxies. In other subjects (such as physics and chemistry) students learn only fundamental, old facts. On the other hands, in earth science student can learn the latest facts and discoveries (in these 20 years). By learning earth science, students can experience the evolution of scientific studies. ・多岐にわたりすぎて「目次学習」に / The challenging thing of earth science is that there are too many topics to learn, and students concentrate in memorizing the facts. ・因果関係の理解…どうしてそれがわかったのか？ / Teachers should teach how scientists made this conclusion/this discovery, not just let students memorize the facts. 例えば、1AUが1.5億キロであるということがなぜわかったのか？/ for example, how did scientists measure the distance of 1 au (astronomical unit), that is, distance between Earth and the Sun? 最近、論理的に考えられない大学生が増えている(という印象を(私が))受ける。このような学生の増加には、因果関係の理解が不足していることが一因としてあるのではないか？/ Today less college students can think logically (Naokiʻs impression). This fact/impression is due to a lack of understanding of cause-and-effect logic. YAC＝ボーイスカウトの宇宙版 / YAC is a kind of a space version of the boy scout. YACは教材作りに力を入れている。/ YAC spends their efforts to develop teaching resources. 先生に宇宙を知ってもらう / YAC sends information of the Universe to schools teachers. / How to increase teachers who are curious about the outer space? –> Astronomers are trained to SEE invisible things. Galaxies/Our Galaxy cannot be seen with our naked eyes, so people are not familiar with galaxies. People are happy and can understand if they can see a visible model/image. A galaxy is extremely large compared to things in our daily lives. YAC is collaborating each local community: YAC’s workplace is a science museum of each city/town. At the Space Shuttle Challenger Disaster in 1986, space teacher Christa McAuliffe died. Ellison Onizuka, an astronaut from Hawai‘i also died. In Hawai‘i his family and friends keep “Onizuka Legacy” and hold annual Astronaut Ellison Onizuka Science Day. This year is the 30th anniversary since Challenger’s tragedy. After Challenger’s tragedy, in 2003 Barbara Morgan, an educator astronaut, was selected as a crew of the Space Shuttle. 宇宙は地学なのか？ Should astronomy and space science be included in earth science? To understand cause-and-effect logic, students should learn physics. However, it is difficult for 10th grade students to do it. Hasimoto-sanʻs point of view makes sense. On the other hand, we should distinguish skill development for experts-to-be from cultural accomplishment/ lifelong learning for general citizens. At citizen levels we should talk about science in our daily lives. Related to a teacher in space, a school teacher has been to Antarctica as a clue of a wintering team. Galaxy Forum returns to the Land of the Rising Sun, one of the world’s 6 major space faring powers, Japan. ILOA collaboration with the Japan Aerospace Exploration Agency JAXA and the National Astronomical Observatory of Japan NAOJ, to advance Galaxy 21st Century Education continues this year at the Cosmos Building kindly provided by NAOJ at the Mitaka Campus. Yamazaki was selected as an astronaut candidate in February 1999, attended the ISS Astronaut Basic Training program beginning in April 1999, and was certified as an astronaut in September 2001. Yamazaki-san has participated in ISS Advanced Training and supported the hardware development and operation of the Japanese Experiment Module. In May 2004, Yamazaki completed Soyuz-TMA Flight Engineer training at the Yuri Gagarin Cosmonauts Training Center in Star City, Russia. In June 2004, Yamazaki arrived at the Johnson Space Center in Houston, Texas to begin Astronaut Candidate Training school. In November 2008, JAXA announced that Yamazaki would become the second Japanese woman to fly in space on STS-131, scheduled to launch in 2010. On April 5, 2010 Yamazaki entered space on the shuttle Discovery as part of mission STS-131. She returned to Earth on April 20, 2010. Yamazaki retired from JAXA on August 31, 2011. Steve Durst — Director, ILOA / Editor and Publisher, Space Age Publishing Co.
ILOA has succeeded in coordinating Galaxy Forum Japan 2012 as part of the major national science festival called Science Agora at Miraikan. Held annually since 2006, Science Agora has continued to be one of the leading science communication events in Japan. Last year the event hosted 194 programs offered by 183 organizing parties; there were roughly 1,700 exhibitors serving more than 5,000 visitors during the three days. Daigo Fujita, Leave a Nest Co., Ltd: Why Leave a Nest’s Space Education Project Engaged So Many People? ILOA Galaxy Forum returns to Japan with the intention of advancing 21st Century Education and renewal for the future of Japan. Our dedicated team of local experts and organizers includes: Misuzu Onuki the Asia Regional Coordinator for the Space Frontier Foundation, Dr. Toshihiro Handa of Kagoshima University and Tomonori Hayakawa a Science Communicator for Miraikan. The National Museum of Emerging Science and Innovation, known as Miraikan, is an amazing facility for the people and particularly the youth of Japan. Saturday 4 December 2010 (1:00pm-5:00pm) @ Miraikan (National Museum of Emerging Science and Innovation). Download the Galaxy Forum Japan flyer here.